Laid down as a member of the CENTAUR class, HERMES was completed to a modified design and her appearance different considerably from her former sisterships. Her small size limited the number of aircraft she could carry, which limited her usefulness. 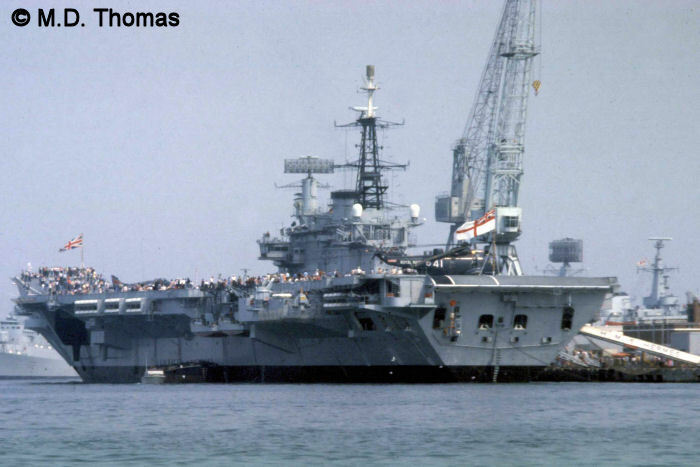 She was therefore converted to a commando carrier in 1971, was reassigned in 1977 as an ASW carrier, and was once again converted into a STOVL carrier carrying Sea Harrier jet aircraft in order to fill in until the final new INVINCIBLE class carrier was ready. It was in this latter guise in which she served in the Falklands War. 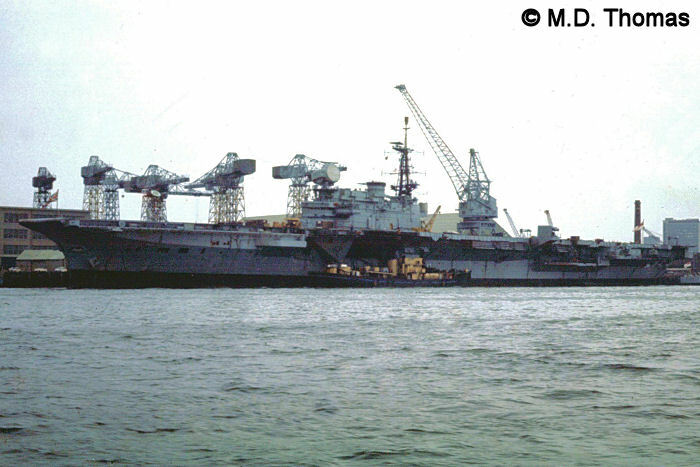 She was paid off in 1984, and sold to India in 1986, where she is scheduled to be replaced in 2010. Total aircraft complement approximately 28-30 of various types. 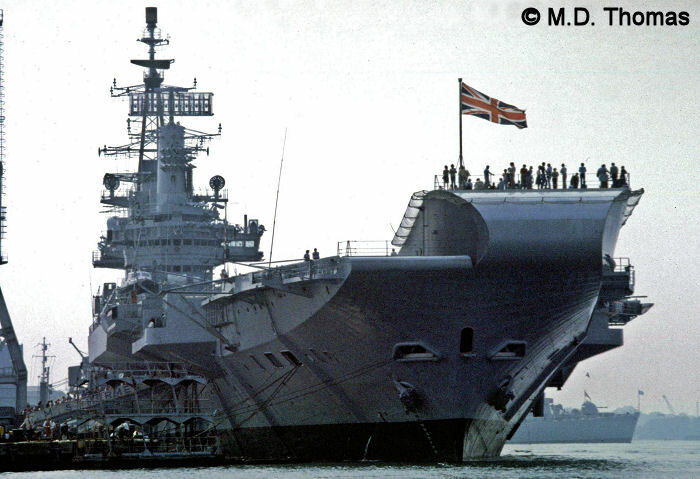 Complement differed according to mission and circumstances, carrying as few as 13 helicopters as an ASW carrier and up to 30 during the Falklands War. Complements are approximate for any given period. See aircraft listing for more information. Participated in the Falklands War. Paid off 1984. 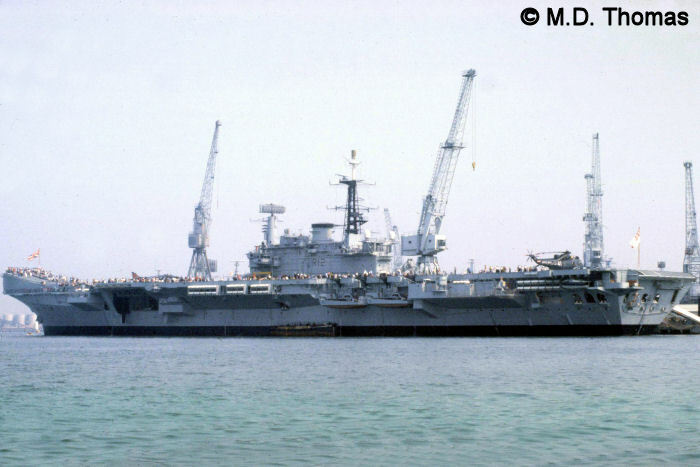 Indian VIRAAT 1986. 1. HERMES prior to receiving the "ski-jump" associated with STOVL aircraft operation. M.D. Thomas Photo. 2. 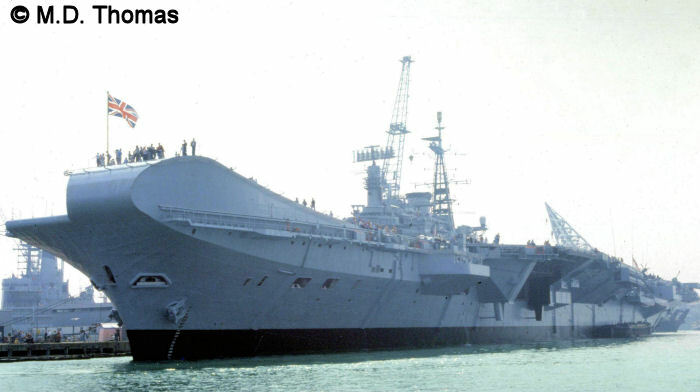 A similar view of HERMES, now fitted with the "ski-jump". 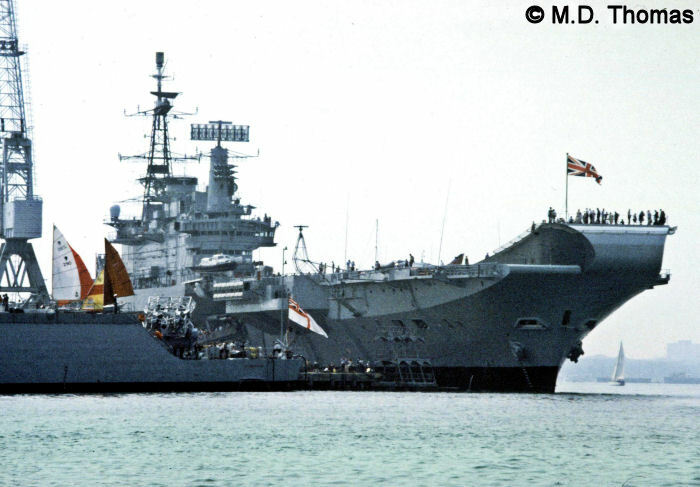 A Sea Harrier and Sea King are visible on deck. M.D. Thomas Photo. Report problems to Sandy McClearn .